We know there are lots of online video makers out there, and while we may be a little biased, we happen to think Biteable is the best around. Still, it can be tough to know exactly what features you really need, especially if you’re new to video making. If you’re looking for an alternative to Powtoon, or just wondering about the differences between Biteable vs. Powtoon, here’s everything you need to know. Biteable offers a free plan with access to many of our best features. You can try out our tool and create up to 5 video projects per month without worrying about your trial expiring. After signing up, getting set up is a snap. First we ask you a few simple questions about your needs to help you get started. If you’re eager to start creating, you can always skip this and fill in the details later in your Account Details. It’s not immediately clear from the website, but Powtoon does offer a 4-day trial of their Premium plan. Once you create a free account and log in to the dashboard, a countdown clock shows the time left in your trial. Getting there, however, does involve a few extra steps. 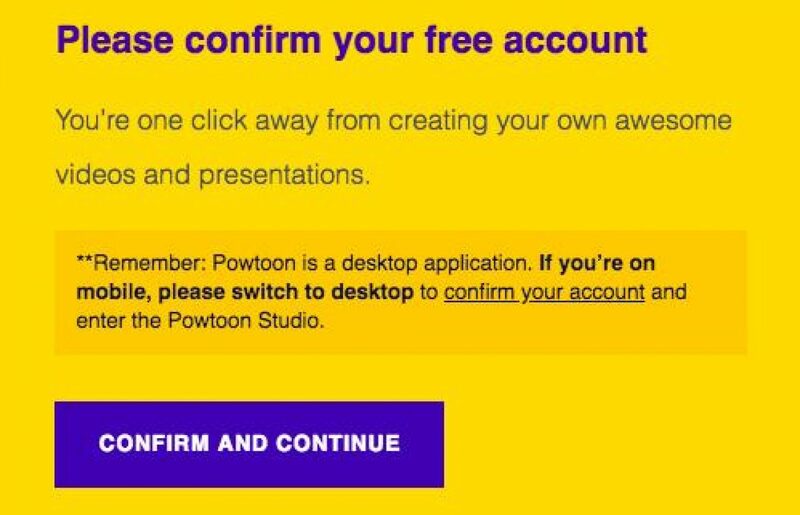 You can sign up for Powtoon with an email address or using a social media account. Before you can log in, you’ll need to head to your inbox to confirm your email address. Note that if you’re on mobile, you’ll have to switch to a desktop system to activate your account. Next you’re asked to opt in to emails. 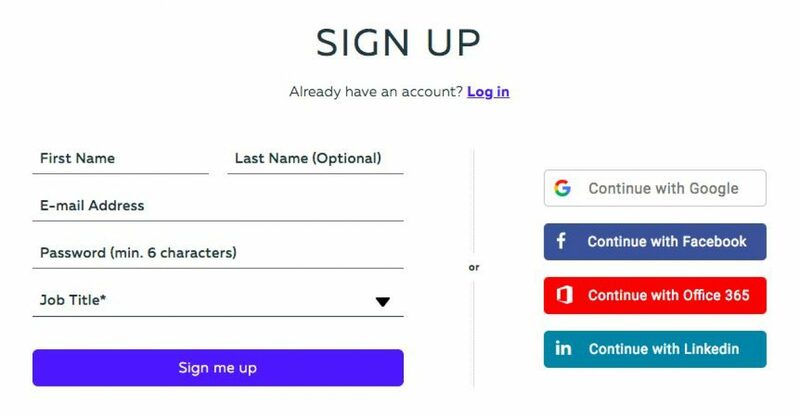 If you opt out, you’re asked again and given the option to subscribe to only certain newsletters before you can log in and go to your dashboard. Our users rave about how easy Biteable is to use. While you can certainly build a video from scratch using our ready-made scenes, our professionally-made templates are where we really shine. 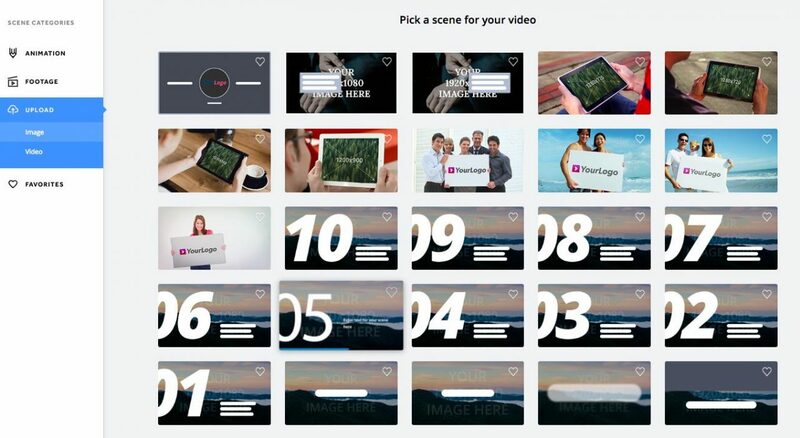 We’ve created hundreds of templates for every possible type of video. And because we know sorting through so many choices can be overwhelming, we’re here to help you pick one. 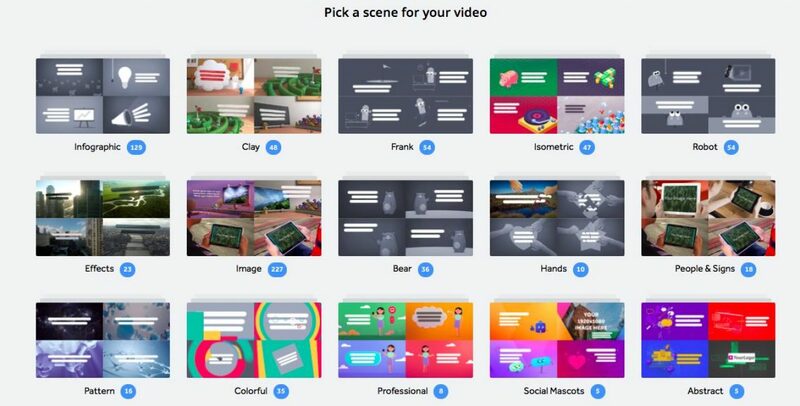 Tell us what kind of video you want to make and we’ll suggest some templates you might want to use. 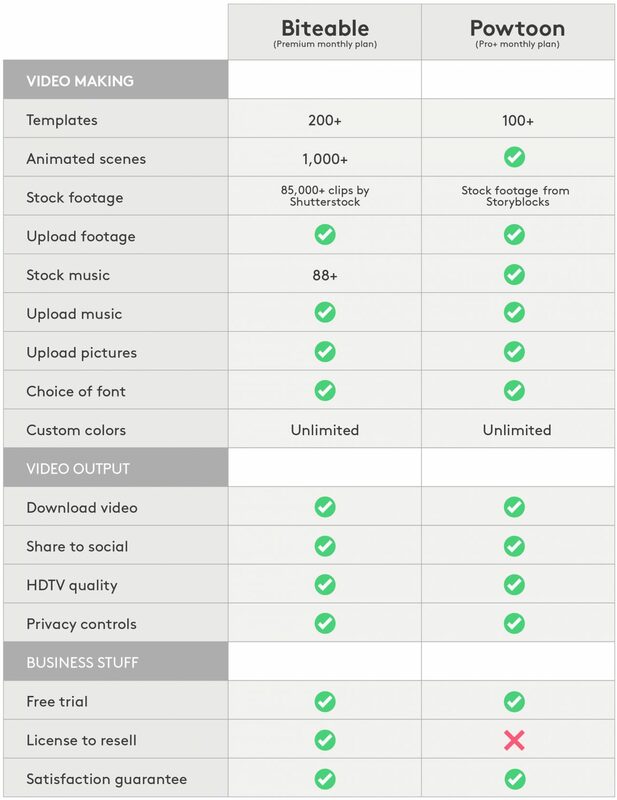 Once you choose your favorite, you’ll be taken to our dead-simple video editor. Here you can go scene-by-scene, adding your text and images. You can swap a scene by clicking and dragging, duplicate or delete it, or add a new scene from our library. We know our users aren’t professional animators — you shouldn’t have to be to create a professional video. 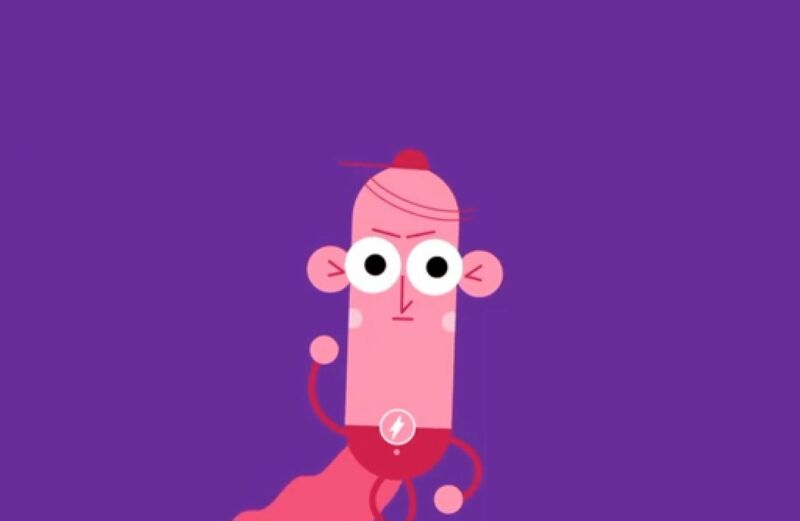 So we’ve created tons of animated scenes to help you get your message across easily. We’ve also worked hard to make Biteable as intuitive as possible, so you’re never guessing what to do or where to click to find what you need. But if you do get stuck you can send a question to our support team right from the editor. 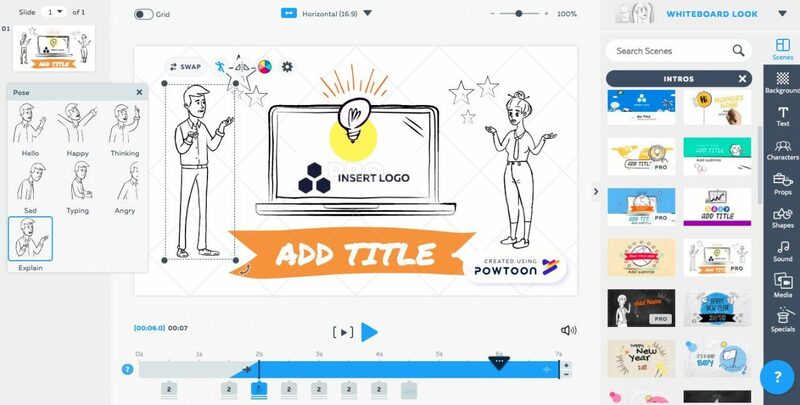 Much like Biteable, Powtoon offer a variety of templates to help you get started. You can choose from different categories and video types. We found Powtoon ran a little slower, likely because its editor is so feature-packed. It took around 20-30 seconds for our video to load in the editor. 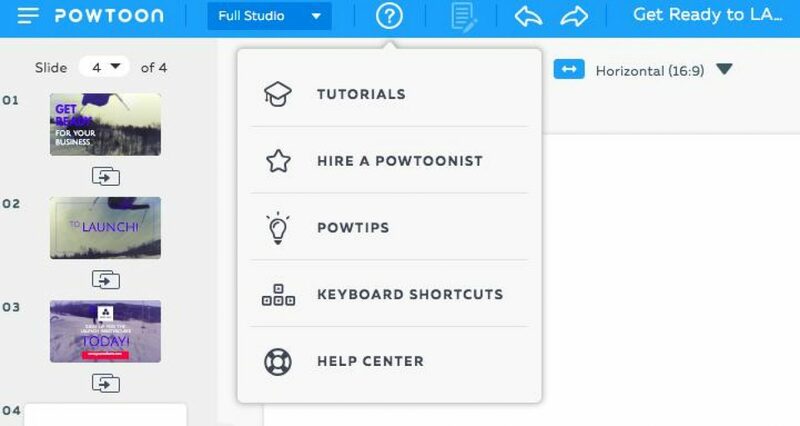 Powtoon offers two editors, the new Quick Edit tool and the Full Studio. Quick Edit is easier to use, though more limited. You can edit, delete, and swap existing elements: images, text, objects, and music. If you want to add a slide or element, you’ll need to switch to the Full Studio. Full Studio gives you much greater control and access to more features. To a first-time user however, the array of features can be a bit intimidating. 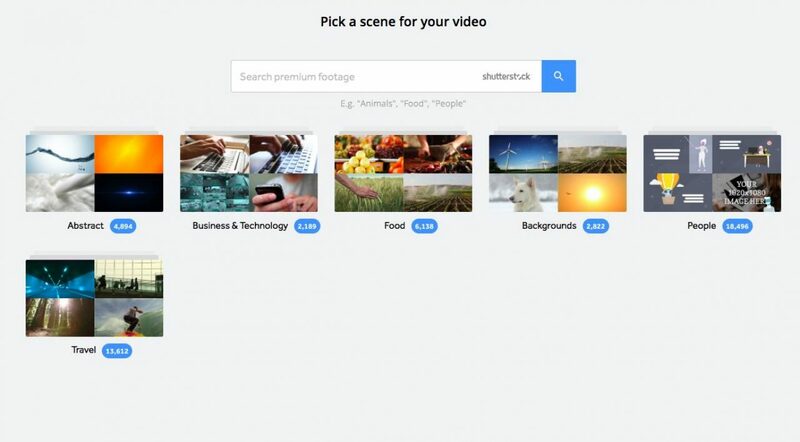 Much like Biteable, you can access new scenes, add stock images, or upload footage. There are tons of different customizations you can add (more on that below). Using a template, with around 5 scenes and only changing text and images, it took a bit longer to create a video than it did with Biteable. We experienced a fair amount of lag while loading, and this does seem to be a common complaint in reviews. We experienced this even without using many of the features. 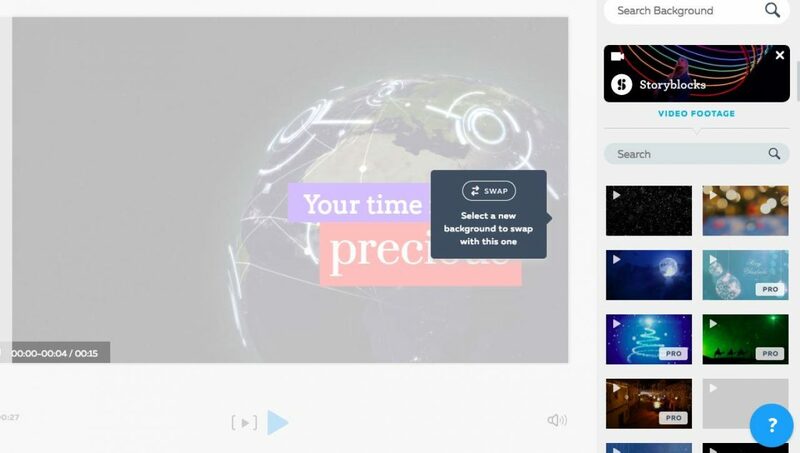 If we’d customized everything to the degree that Powtoon allows, we easily could have spent hours on a video. 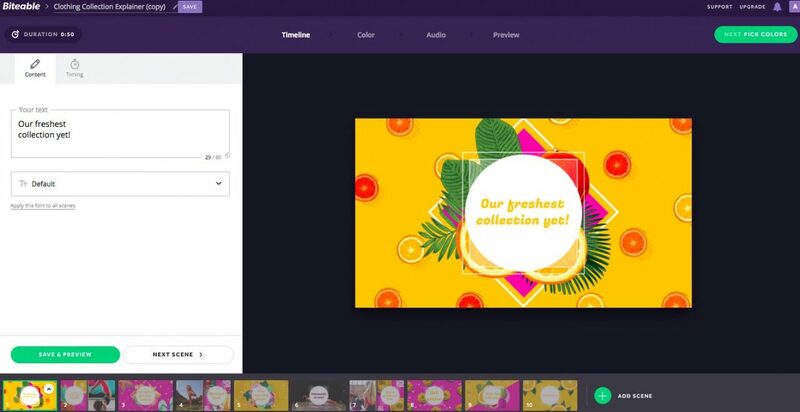 Biteable offers plenty of features to help you customize your video. We have 1000+ different scenes you can swap in and out to help tell your story, including live action, animated, and claymation. You can change the timing of some scenes, opting for a shorter 3-second version for punchier, faster-paced transitions between scenes. You can choose from around a dozen different fonts, with different looks for every brand, and you can customize the colors in your video. 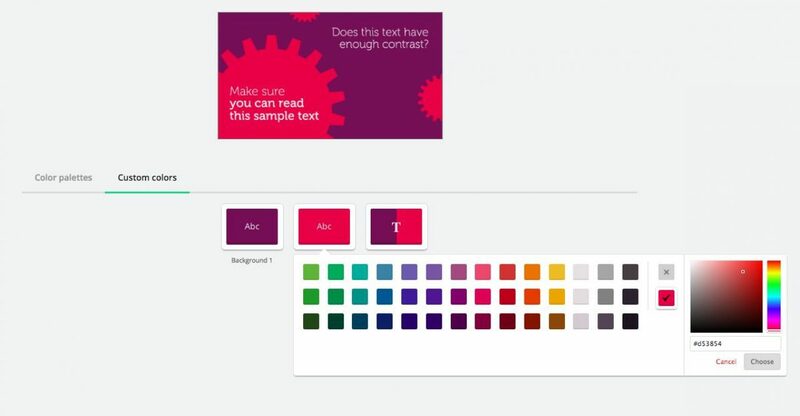 Use one of our pre-made color palettes or choose custom colors for your backgrounds and text. You can add a soundtrack from our music library or upload your own. And, of course, there are scenes you can customize further by adding your own images or video, or choose from our library of more than 85,000+ stock footage clips. 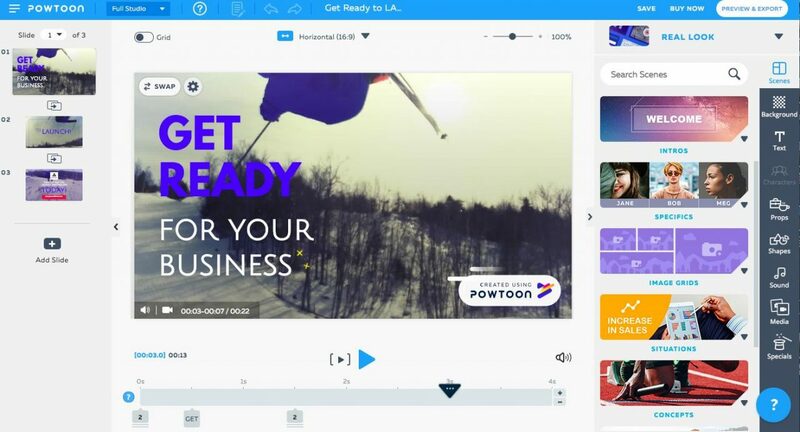 With Powtoon, nearly every element is customizable. First you choose from ‘looks’ like Cartoon, Whiteboard, and Real. From there, choose scenes, characters, props, shapes, special effects, and add text. Most elements come in multiple looks and have different variations you can choose from. You can change the colors of every element, customize transitions, and add animation to elements and characters. In fact, so much can be tweaked and changed that for a new user or someone not experienced with animation, the sheer number of customization options can be a little overwhelming. Biteable has 200+ beautiful video templates, created by our in-house team of professional animators and video creators. 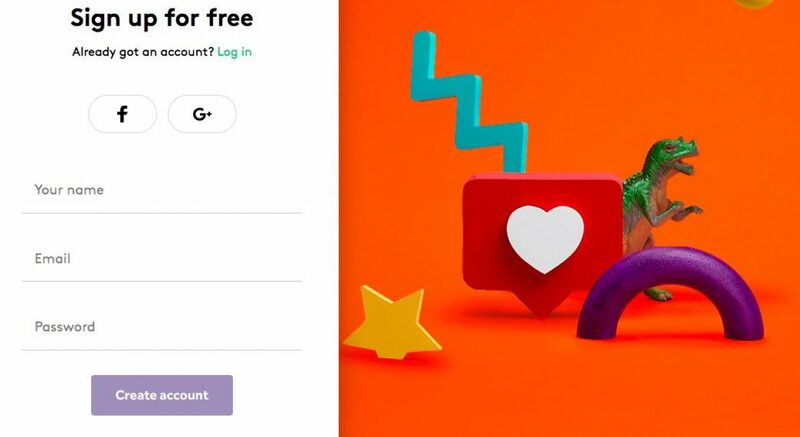 Every one is available for free and paid users, and we’re constantly adding new ones. 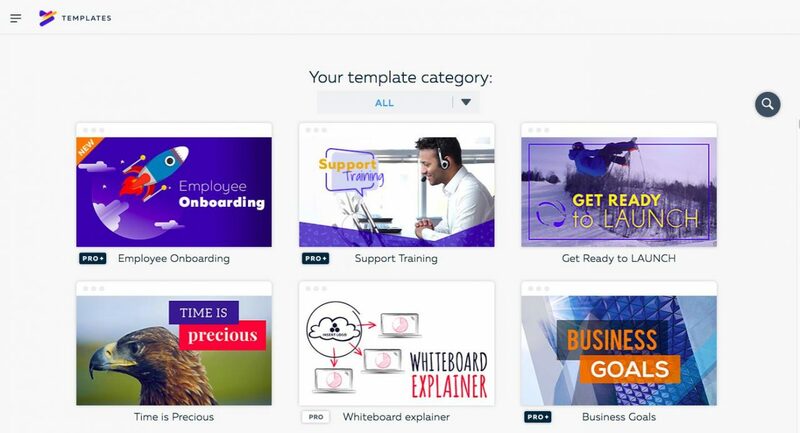 Our templates are optimized for different video types, from explainer and promo videos to social media posts and infographics. Creating a video with Biteable is as easy as choosing a template and adding your content. 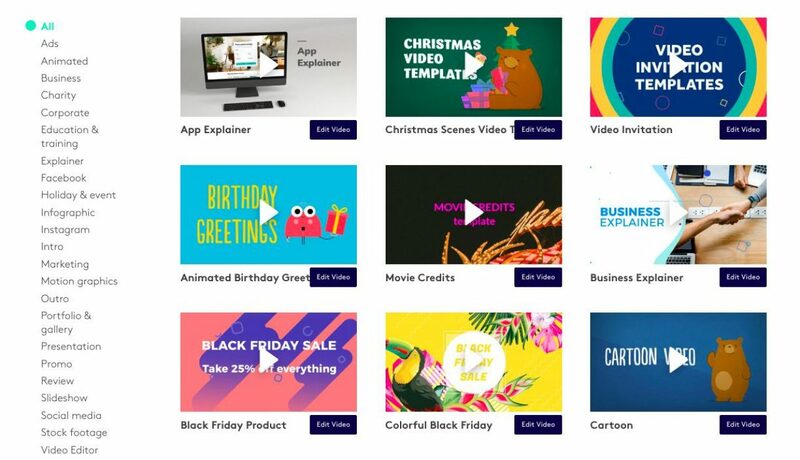 Powtoon has 100+ templates categorized by Work, Education and Personal, then further organized into different types, like Marketing, Video Ads, and Holiday. There are animated as well as live action templates, and some templates are available in both a square and horizontal aspect ratio. Some templates are available under the free plan, while others require a Pro plan, and others are only available to Pro+ members. You’re able to add additional scenes from a number of different collections, each categorized under different ‘looks.’ Though again, some of these are only available to paid plan members. A free Biteable plan includes access to hundreds of stock video scenes for every theme and industry. You can choose from abstract footage, people, industry, landscapes, animals and much more. The Biteable Premium plan gives you even more options. 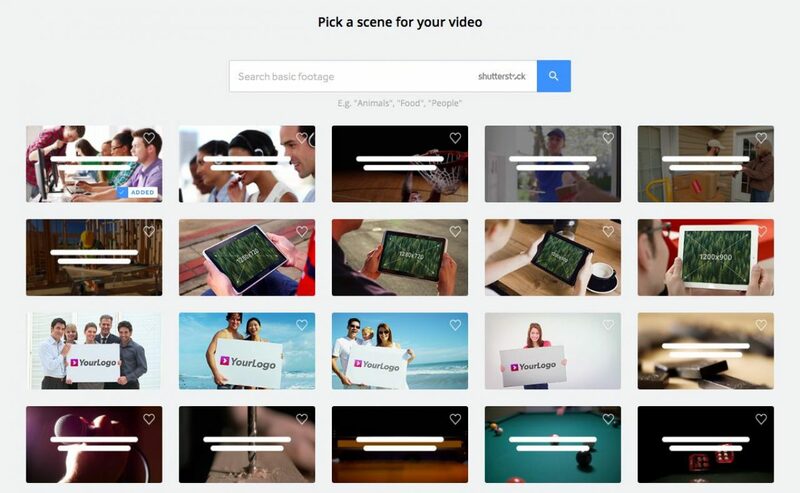 Users have access to the basic set plus 85,000+ free Premium stock footage clips. But there’s more: Biteable is also integrated with Shutterstock, one of the largest stock photo and video libraries around, so you can buy any further clips you need (at a discounted price). Powtoon has several video libraries, each with a few dozen free and premium footage clips. Each library consists of ready-made videos that can be added to your Powtoon. The Marketing and Urban & Nature video collections include abstract video scenes, lifestyle, and landscape footage. 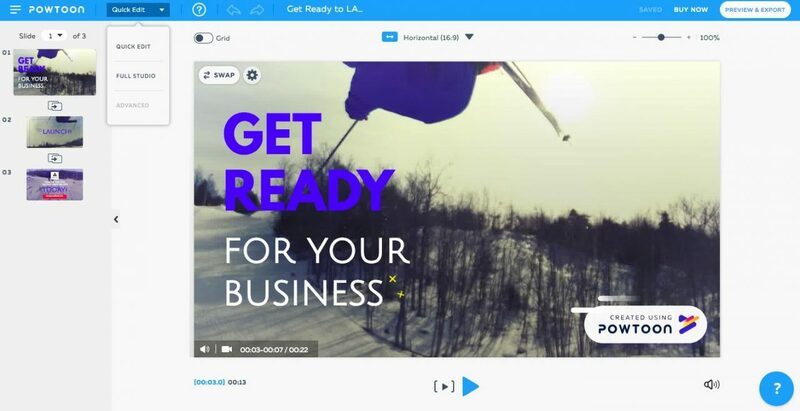 Powtoon is also integrated with Storyblock’s stock footage library, however, free clips are limited — typically a search will yield a few free video options, but many more Pro or Pro+ results. While Storyblocks has 100,000+ video clips in its collection, it’s not clear how many clips are available via the integration with Powtoon. 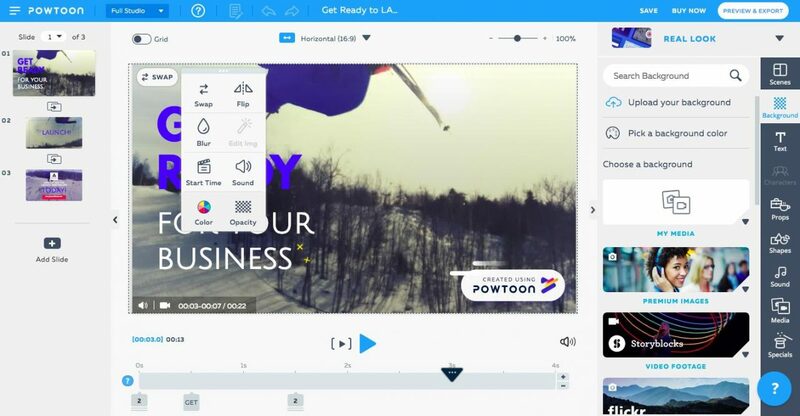 If the built-in footage doesn’t fit your needs, you need to purchase and upload your own stock footage to Powtoon. Biteable comes with 88+ song choices in different genres and energy levels, from pop and electronic to folk and rock. You can also upload your own voice-over or music track. 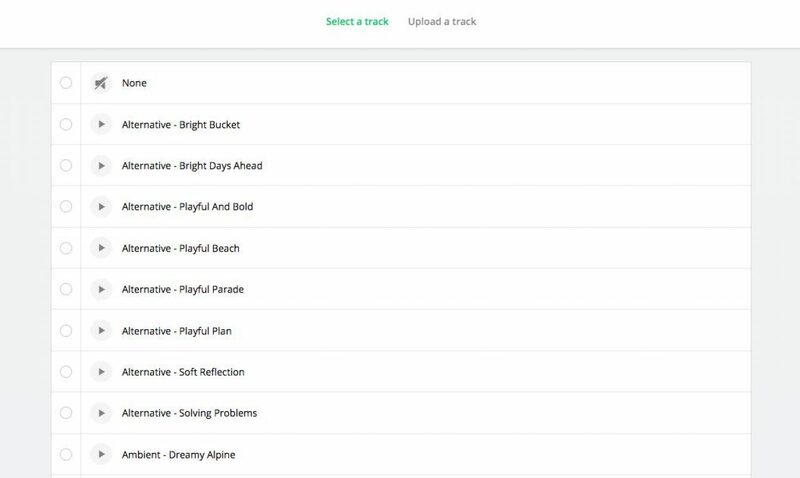 All our music options (and the ability to upload a track) are available for both free and paid plans. 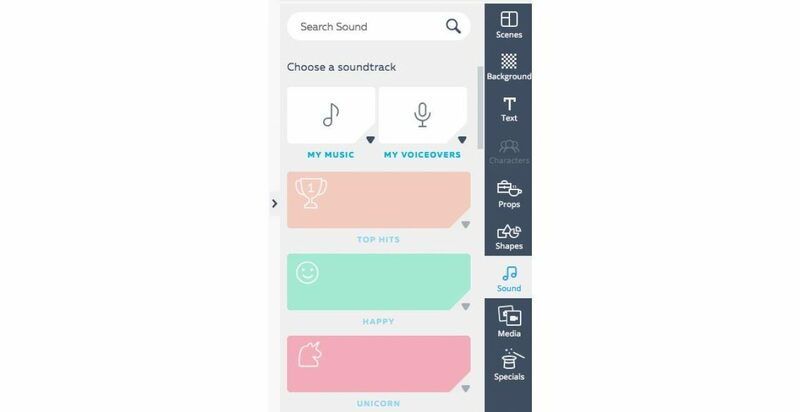 Powtoon offers several music libraries with different themes (e.g. Happy, Motivation, or Corporate). Some soundtracks are available with free plans, while others require a Pro or Pro+ membership. You can also upload your own music (or voice-over) or hire a composer through Powtoon’s integration with Fiverr. Powtoon again gives you a lot of control here, including the ability to select different music for individual slides, or choose where in the song to start playing. Many of our Biteable templates and scenes can be customized with your images — whether you want to add your logo to the intro or outro, showcase your product, or create a slideshow. It’s as simple as choosing a scene or template that allows custom images and uploading yours. If you need stock images, we recommend checking out these sources for royalty-free images for your videos. Powtoon includes some built-in options for adding stock images. Premium stock photos are available for Pro and Pro+ members, while free images are sourced from Flickr. Once you’ve finished creating your video in Biteable, it’s time to build your preview. If you have a lot of scenes, this can take a few minutes (a rough guess would be about a minute for every scene in the video), but you can always leave the page and come back later. When your preview is ready, give it a watch. If you need to change something, you can go back and edit. Once you’re happy, Preview again, then click Publish, and your video will be ready instantly. From this page, you can add an end scene with a call to action button, share it to social media, or get embed links. If you’re a Premium member you can also update your privacy settings and download your video. You can also download your videos from your My Videos page if you forget to do it at this point. This process takes just a few minutes. Then you’ll need to add some additional info, like a description, tags, category, and privacy setting. Finally, you can choose to hide branding and select your video resolution if you’re a paid plan member. Once your Powtoon page is ready, you can share on social media or embed on your website. Although there are a few more screens to get through, the process goes fairly quickly. There doesn’t appear to be a way to add a call to action button to the end, however. No matter what plan you’re on, Biteable videos are always 1280×720 (720p/HD) resolution. This is the same image resolution broadcast by many HD television channels, and is more than twice as sharp as a 480p standard-definition (SD) video. Videos will appear crisp and sharp on most displays. Powtoon quality varies depending on which plan you choose. Free plans are in 480p standard-definition (SD) while Starter and Pro plans are in 720p HD. Pro+ and Agency plans get 1080p (full-HD) resolution. At Biteable, we’re all about helping you get the most out of your videos. We’ve not only got a FAQ section full of tips and tricks for creating videos with Biteable, but if a question comes up while you’re creating, you can start a chat with one of our customer service operatives right from the video editor. We have team members around the world so we can cover every time zone, and will always try to answer questions within a few hours. The first time you use Powtoon, a feature tour pops up. This is helpful — essential even — since navigating the features in the Full Studio is a bit confusing. Even with the tour, you’ll likely want to make use of the help center that’s available within the editor. You can also click the question mark for tips and tutorials, or to hire a professional ‘Powtoonist’ if you’re ready to throw in the towel. Paid Powtoon members get Priority Support, which means help tickets are placed in the priority ticket queue and receive faster replies. There’s no doubt Powtoon is a powerful tool, that’s clear as soon as you log in. But with that comes a steep learning curve. Given that you can hire an “expert Powtoonist” to create your video for you right from the video editor, it does seem like you need to be at least somewhat experienced to get the most out of it. And we did find in reading reviews that some of Powtoon’s biggest fans are professional graphic designers and video makers. If you need a lot of control — for example, the ability to make animated characters move the way you want — then Powtoon might be worth a try. In terms of advanced editing features and degree of customization, Powtoon stands out. However, many of the best assets and features aren’t available on the free and starter plans, only the more expensive Pro and Pro+. 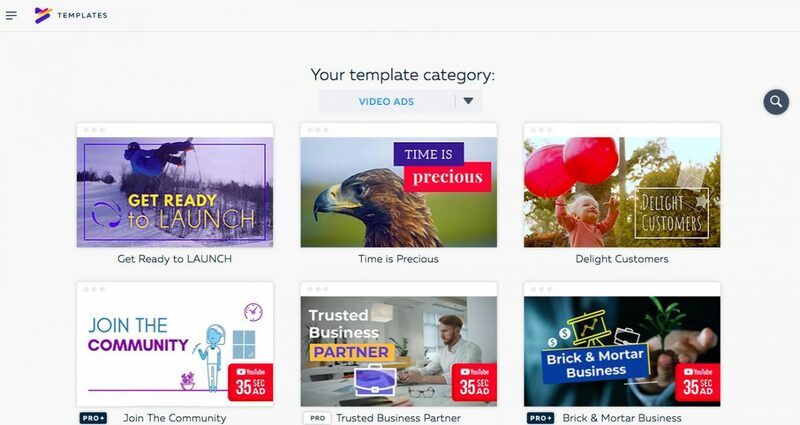 Biteable offers more free templates and assets, as well as a huge library of premium stock footage, better resolution than Powtoon’s low-priced plans, and our ease of use can’t be beat. 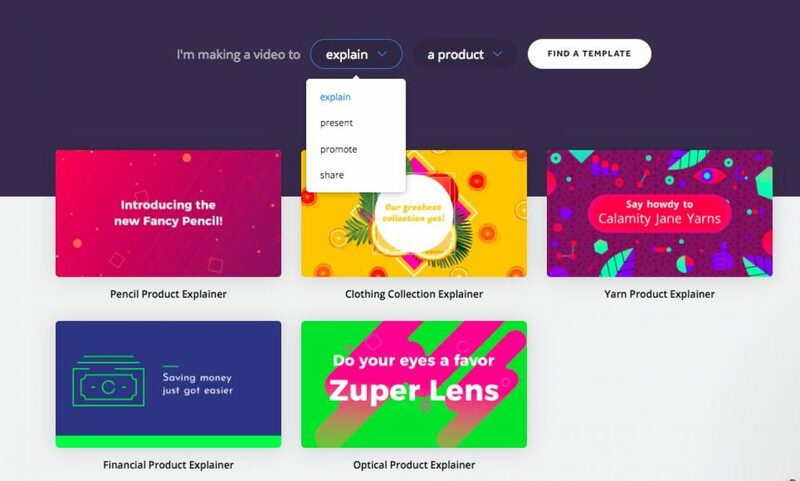 Bottom line: if you need to make simple videos super quickly, or if you don’t have time to learn a new tool, we think Biteable is an outstanding alternative to Powtoon.